It is not required for context, but if you want to read my previous post about horses then here's the link. A funny thing about horses is that they will reflect back to you points about yourself and almost force you to face them. Working with such a large animal is quite daunting, but while you are learning about them you can see most clearly what a horse can show you about yourself. As you gain more skill it is not quite as 'in your face' as when you are new at everything. So what I have seen is that a horse will change certain behaviours according to the specific person working with it. I have seen a few times how a horse will challenge someone to face a point they resist, a point like 'authority' (like taking a leadership role) - this point is quite common as it seems that it is the nature of most people to follow rather than to lead. What will happen is that when you are not clear in taking your position as leader, the horse takes over and becomes the leader, essentially challenging you in your resistance to take on your position. I don't mean that a horse will challenge you in an aggressive way, I mean that the horse would be less likely to listen to you and more likely to do whatever it wants to do. In those moments that you do not fully embrace your role of leadership, the horse will simply take over. Leadership is the most common point that a horse will challenge a person on simply because the nature of the horse requires that there always be an established leader who is 'looking out for danger'. Another common point for a horse to challenge you on is your consistency and follow through. A horse will often test to see how serious you are about asking something from them and if they find that if they push the point just so that they can get away with not having to do it. Sometimes they will do something half hearted, but most of the time we are oblivious to this fact and accept their unenthusiastic effort. This leads to the horse putting in less and less effort and generally becoming less pleasant to work with. All of this could be avoided with consistency and observation. With a horse you must always be very clear about what you are asking for, but also very particular about it. Most of us seem to lack this will to be consistent and persistent, we tend to give up after so many tries, which leads us to miss opportunities. The second point, follow through, is about meaning what you say. If you ask a horse for something but don't follow through until you get an acceptable result then they don't respect you and essentially regard you as unreliable, because from their perspective one minute you're saying this and the next it's that - so they just don't bother. All of the above can be applied to some degree with dogs and children - if you do not embrace your position of leadership fully and live it, others will not be confident to follow you. If you are not consistent in your actions then others will regard you as unreliable and changeable, maybe even as untrustworthy. If you do not follow through on your actions then others will regard you as unreliable, timid and possibly even as weak. 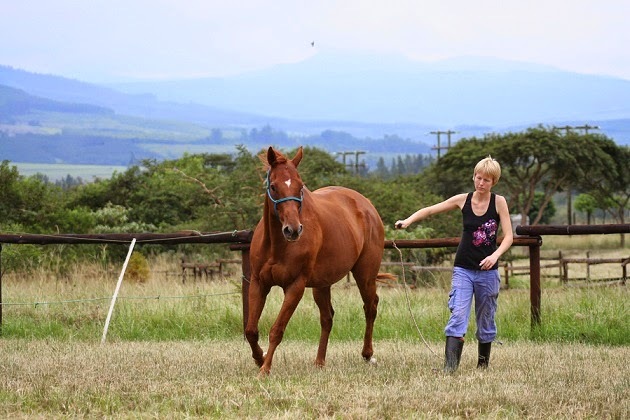 When you're working with a horse all of these aspects are magnified 10 times simply because of the sheer size of the horse - their every movement seems huge, when they step into your space you will definitely feel their presence. These things may not be so easy for everyone to recognise when dealing with their day-to-day lives, the awareness of these points simply does not exist in most people. Obviously you don't have to work with a horse to learn things about yourself - a bit of awareness in your daily living will tell you everything about yourself and about how others see you.